"Karate is suitable for every age, everybody, boys and girls". "But Karate practitioners should be non-belligerent. If a belligerent person used his Karate for bully to other, his Karate is nothing. If someone uses his Karate on ARROGANCE (INSOLENCE), his Karate is NOTHING". “I am a karate teacher since 1978. I have teaching experience 36 years in karate. I have had experience 44 years in karate. However, I am always a "Senior Student" and "Junior TEACHER in karate. "Karate has been a part of my life since I was 10 years old". "The karate student must humble himself to receive training and his daily life”. "Theory without practice is nothing. Practice without theory is nothing". "The essence of Karate is to be humble and not to be arrogant". "Without Kata in Karate is blind". "Without Kumite in Karate is blind"
"Kata is actually the very essence of Karate". "Kumite is actually the very essence of Karate". "Without combat training in karate is nothing". "Without sport training in karate is nothing". "I enjoy karate whether I'm teaching it or learning it. It's done a lot for me effectively and I've seen what it's done for so many others as well …." "We must do learning, reading, writing, teaching, sharing, researching and practicing meditation. I have been trying to develop of Karate for everyone everywhere as much as I can." 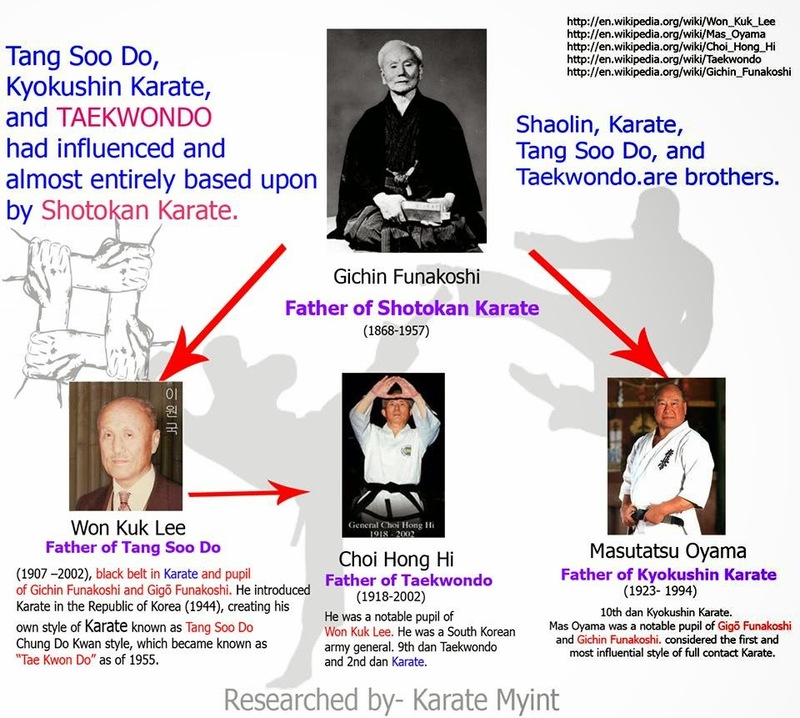 "Real traditional Karate is the essence of true Karate and most effective in the early days. the real Karate not only involves athletic training, but also practices Kihon, Kata (+ advanced Bunkai), and Kumite systematically". "Sport Karate is good, especially good for health but sport karate is not completely useful in a real ground fight. Sport Karate cannot be called as a real self defense". "We should be aware of the loss of true real traditional karate's systematic techniques". "Sport Karate is losing true qualities, powerful methods, and useful techniques. On the other hand, "Real Karate" is very USEFUL for protecting yourself from enemies". “We all karate practitioners MUST not be poisoned by the seven poisons such as: greed, anger, hatred, stupidity, conceit, jealousy and malice. We all instructors and students MUST abstain from all evil, killing, committing murder, suicide, stealing, lying, betraying, sexual misconduct, adultery, polygamy, homosexuality, intoxication and bullying." “It must adhere to the traditional values and principles of karate. It must be realistic in blocking and fighting terms and display concentration, power, and potential impact in its techniques. It must demonstrate strength, power, and speed — as well as grace, rhythm, and balance. It must be performed with competence and a clear understanding of the techniques". Do not bully to other. It must follow the teachings of his father. It must follow the teachings of his mother. It must follow the teachings of his teacher. Regularly practice the real Karate. “The equation F=ma (Force = mass x acceleration) is based on considered the most important for your powerful punching and kicking“. “Don’t forget relaxed your body and mind, will power, self confidence, impact, ability of focusing, concentration of power, speed, tense, solid compact, and solid tighten the mass. Therefore the purpose of tensing the muscles of the body on impact is to increase the effective mass of the technique“. Nevertheless loving- kindness (Metta) and patience is the BEST of the BEST. 師範 Myoma Myint Kywe "some lecture topics"
· We must control our tongues . · Let us cultivate true love and real compassion. · Right understanding, right thinking, right concentration, right mindfulness and right effort etc are very needed excellent. · Forgiveness is a virtue. Forgiveness is better than fighting. Patience is a virtue. Patience is better than fighting . BUT, Patience has its LIMITS. Take it too far, extremely patient, and it is cowardice. - Nevertheless, forgiveness is the best part of human nature. - Nevertheless, patience is the best part of human nature. · Fighting (counterattack/ fight back) is better than surrender.
. Counter-attacking (fight back) is the BEST when someone trying to kill you on the road and everywhere.
. You can SAVE and SURVIVE yourself from when facing any dangerous situation and dangerous attacking on you. · Don't forget parent and teachers' gratitude. · Honest man is greater than success man. · An honest man is maybe not skillful in jobs but you teach him how to do skillful in job, we can trust in him and you should become rely on him. · No perseverance, no success. · Success is no accident. · Everyone should not be poisoned by the seven poisons such as: greed, anger, hatred, stupidity, conceit, jealousy and malice. · Everyone should abstain from all evil, committing murder, suicide, stealing, lying, betraying, sexual misconduct, adultery, polygamy, homosexuality and intoxicants. · We should always maintain HONESTY and HUMILITY. · We should do to cultivate the power of COURAGE by strengthening our mind and body and overcoming any difficulties in our life. · We should stand in truth and we must stand for truth. · We should abstain from hypocrisy, pessimism and terrorism. - I think each of everyone has ups and downs, happy and sorry, wins and lose, loves and hate in their lives. You practice how to be honest to yourself and to be honest to others. You study how to be humble to yourself and to be humble to others. How to reduce hatred and how to stop the hatred? How to reduce anger quickly? How to control your mind? How to stop arrogance and belligerence? - The essence of karate is to be humble and not to be arrogant…. 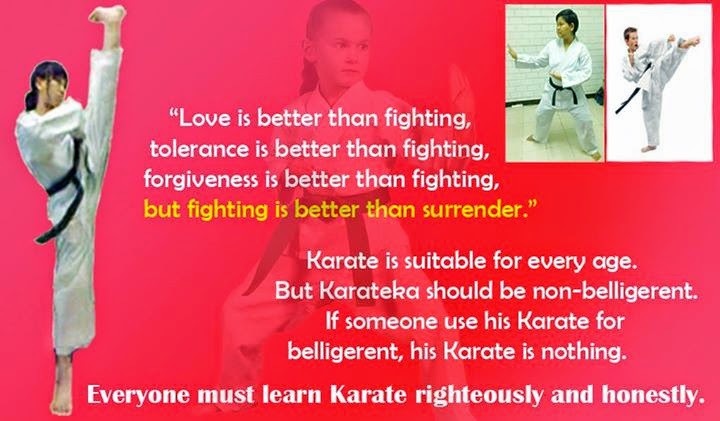 - The essence of karate is to be humble and not to be belligerent …. - The martial arts philosophy, or at least the traditional karate philosophy, is called the ethics of karate. - You can hate (fight back) to your enemies if you cannot forgive them, BUT you don't use your counter attack deadly force on him/ them. You don't destroy their lives. - You want to protect yourself in cases like these. It's only natural. But you should know about the legal limits on self-defense. - The laws on self-defense vary from one event to another event, but in general you're allowed to use reasonable physical force to protect yourself from imminent or immediate physical injury. You can only use that amount of force that's necessary to stop the threat of harm. - The other person lunges at you or tries to punch you, kick you, you can protect (counter attack) yourself by fighting back. If you fight back and the other person gives up or is unable to defend himself, you do NOT continue to hit him - it's an unreasonable use of force. - If the other person doesn't come close enough to you to actually hit you and he doesn't have a weapon and he starts to walk away, you can't chase after him and hit him - the threat of harm to you isn't imminent. - These are very simple examples and very general rules. The facts and circumstances of each case and the laws in your country will determine if you acted properly in defending yourself. - The keys to remember are: You can use only that amount of force that's necessary to protect yourself from immediate harm.